Nairobi Safari Walk is a Kenya Wildlife Service Conservation project seeking to inform visitors to Kenyan's wildlife and their habitats. The Safari Walk is a splendid conservation facility designed to enhance visitor's appreciation of Kenya's flora and fauna. It is a showcase of Kenya's vast natural diversity. Nairobi safari walk provides visitor with an experience of Kenya's three eco-systems namely the savannahs, forests and wetlands. Located 7 Kilometers from Nairobi city, Nairobi Safari Walk gives visitor a clear picture of what to look forward to in Kenyan National Parks. Guests can walk along the raised boardwalk, through the different habitats and observe from close range the wonderful variety of wildlife in each eco-system. 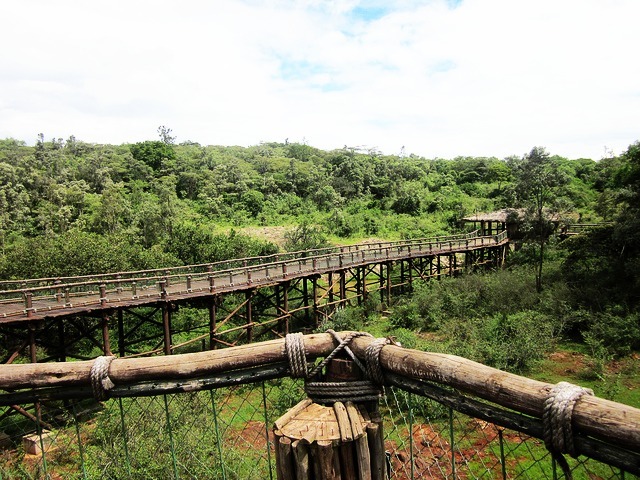 The raised wood walkways provide souring views out over the shimmering stretches of savannah in the Nairobi National Park with observation points down onto waterhole's and the wildlife that frequent them. Meandering through 27 acres of wilderness, Nairobi Safari Walk offers a neatly encapsulated walking safari. The Safari walk is open every day from 8:30 am to 15:30 pm. Animals include: Antelopes and gazelles such as Bongo, Gazelle (Thomson's), Gnu (White-bearded) and Impala. * Nairobi Safari Walk tour can be combined with the tour of the Animal orphanage located 10 meters away.